Defenders of Prop. A in Encinitas say they’ll keep fighting for the measure no matter what, the representation gap in Escondido and more in our biweekly roundup of North County news. 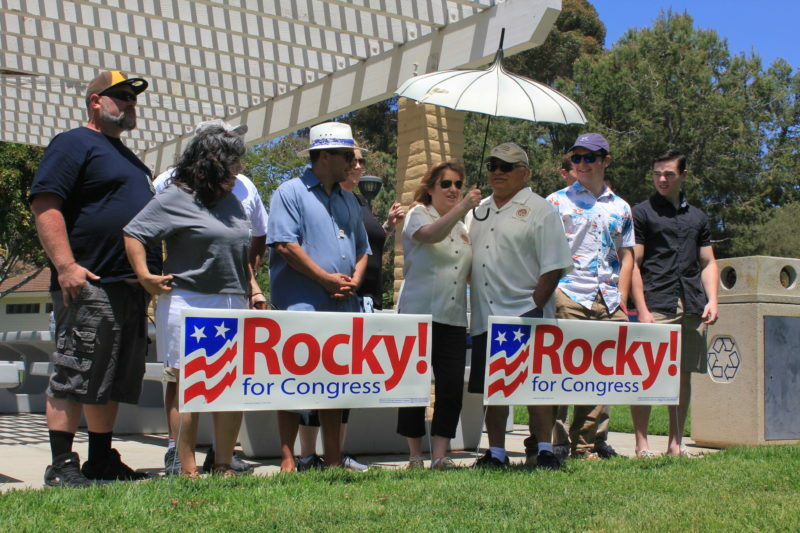 Rocky Chavez is running for Oceanside mayor and not the California Assembly in 2020 for a simple reason: The GOP has little to no influence over the state’s affairs, he said. Democrats have such overwhelming control of the Legislature that if they unite, they don’t need a single Republican to pass anything into law. Of course, the Republican dominance over North County is also waning. Today, there are more registered Democrats than any other political affiliation in Oceanside and about as many “no party preference” voters. That’s why Chavez thinks he has a good chance at returning to his roots on the Oceanside City Council, where he served for seven years before joining the Assembly. Chavez is undoubtedly conservative. But what the former Marine colonel has going for him this time around is the same thing that Republican activists criticized him for in the California Legislature — his independent streak. Notably, he sided with Gov. Jerry Brown in 2017 to pass a key piece of climate change legislation and he was crucified for it, even though cap and trade was originally a Republican idea. Some critics falsely accused him of having supported the state gas tax hike. He’s convinced, though, that none of that really matters in the Oceanside mayor’s race, because voters tend to have a short memory. Still, I wanted to know how Chavez intends to rebuild bridges with local GOP leaders, and the 67-year-old quipped that they’ll happily continue to take a portion of whatever money he raises over the next year. He also disagreed with the premise of my question. Coupled with his experience atop the Governor’s Military Council — which helps keep the Department of Defense dollars flowing into the region — and the Tri-City Medical District, Chavez thinks he can make a bigger impact at home than in Sacramento. It’s not immediately clear who’s going to challenge him. Oceanside’s current mayor, Peter Weiss, a former city manager who was appointed in early 2018 by the City Council after Jim Wood suffered a stroke, is on the fence. Weiss told me that he’s eyeing the District 4 City Council seat instead, because the mayor doesn’t have any more authority than a City Council member. But his decision will depend on who gets into the race and what ideas they’re advancing — whether they want to plan for the city’s long-term development or whether they just want to shut down conversation, Weiss said. He’s particularly hesitant to run against Chavez because they might split the vote and allow City Councilwoman Esther Sanchez, a Democrat, to win, Weiss said. Sanchez is often the lone no vote on controversial proposals and she, too, doesn’t much give a damn for what people think about her. Chavez is looking forward to that possible match-up (and so am I, obviously). He overlapped with her on the City Council and has a mental reservoir of votes she’s cast over the years that he didn’t like. To be clear, Sanchez hasn’t made a decision yet on whether she’s running for mayor, but she told me she’s definitely considering it. She’s not alone. The city clerk’s website shows that Jack Feller and Jerry Kern, both Republicans, have pulled papers to run for mayor. Michelle Gomez, a Democrat, has pulled papers for both the mayor’s seat and District 4, which pulls mostly from the subdivisions on the city’s eastern side. So what does Chavez mean when he talks about impact? Development is very much on his mind as he begins to wade into the race — particularly downtown and along North County Transit District lines. It makes no sense, he said, to put condos on the city’s eastern side because the remaining agricultural land is ripe with character. More importantly, he said, those areas lack the sewage and water infrastructure to handle the growth. He also came down hard against the community choice movement. Oceanside and several other North County cities are studying the possibility of banding together and joining San Diego to form their own public energy agency. Billed as a cheaper, green alternative to monopolies like SDG&E, such programs are gaining steam throughout California. He argued that by detaching the city’s residents from a larger utility grid, the risk of blackout is greater. He also questioned whether the costs of leaving SDG&E wouldn’t be passed down to the poorest communities, though a law is in place to prevent that from happening. Encinitas is through with its own slow-growth rules. The Coast News reports that the City Council wants to ask a judge for permission to invalidate or amend Proposition A — a local law giving voters veto power over major land use changes — to comply with the ongoing demands of state housing regulators. Until last week, Encinitas was the only city in San Diego County that had not adopted a plan identifying sites for housing development of all income levels. It was not for a lack of trying. Prop. A required that voters get the final say on housing plans, and in 2016 and 2018 those plans went down in flames. After developers and renters sued, the San Diego County Superior Court in December suspended Prop. A, citing the law as the reason Encinitas was continuing to defy California rules. Mayor Catherine Blakespear was then summoned to a meeting with the governor and effectively shamed. Prop. A’s defenders are not going to let the law die so easily. Arguing that the city hadn’t adequately defended their interests in court, attorney Everett DeLano attempted to intervene in the cases, which had been initiated several years ago, on behalf of a group called Preserve Prop A. The court on Friday said nope, too late, good luck. Before the ruling came down, Charlie McDermott, an Encinitas resident and corporate exec, told me that he and his allies have long considered Prop. A a check on housing plans that only benefit well-to-do people. If the city was serious about housing low-income people, it should force developers to actually build more affordable units, he said. It’s not immediately clear — to McDermott or to me — what types of rules the city could draft to get there. But we’ll be living with this tension for a very long time. North County Is Diverse. Its Public Agencies, Not So Much. A report by the Center on Policy Initiatives, a left-leaning San Diego think tank, that was presented last week at a forum in Escondido drives home some of the region’s racial leadership gaps in local governments and schools. For example, the trustees who run the Escondido Union High School District appear to be all white — they didn’t respond to CPI — but white students made up 27 percent of the enrollment in 2016. Most of the remaining 73 percent of the student body identified as Latino. The report offers one explanation. About half of the voting age Latinos who live within the district are not U.S. citizens, so they represent only about a quarter of the district’s voting population. But the district’s population of underage Latinos is growing, and about 94 percent of them are U.S. citizens, meaning their effect at the ballot box will eventually be felt. So how does this disparity impact students and parents? CPI argues that less diverse public bodies are less willing to “tackle social issues in the interests of students” and take policy stands against the Trump administration. Escondido City Councilwoman Consuelo Martinez, a community organizer, was asked at the forum for an example of a difficult decision she’d made in office, and she pointed to the city’s ongoing debate, as the U-T reported this week, over where to build recycled water treatment plant. She’s been pushing to reverse a previous City Council decision to locate the plant in a mostly Latino downtown neighborhood. The Los Angeles Times poses an interesting question: Can unabashed progressives like Rep. Mike Levin survive in districts that remain heavily Republican? He’s made climate change his signature issue. He also introduced a bill to address reports of poor living conditions at privately run military housing sites, the U-T writes. I wrote earlier this month about efforts in North County to reach every community for the 2020 Census. The Times of San Diego now reports that a coalition of local organizations just received a $1.66 million grant for outreach efforts. Ry Rivard contributed to this report.